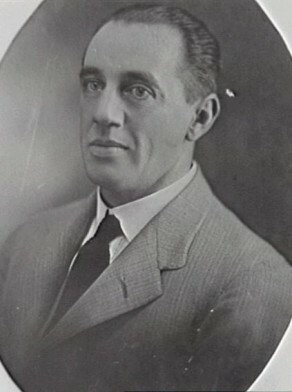 John Richard English was born at Sydney in 1884, son of Alderman John English (1857-1919) and his wife Jane. In 1911 at St Leonards, Sydney, he married Violet R Alexander and had at least one son and a daughter. He died at Petersham on 27 November 1929. John Richard English may have inherited his father’s tailoring business. From 1911 to 1916, he was in communication with the Council about resumption of his land at 60 to 68 Kensington Street. He was an enthusiastic amateur boxer and a keen supporter of Rugby League. John Richard English was elected Alderman for Denison Ward at a by-election on 21 August 1924 to fill the vacancy created by the death of Alderman Clarence Walter Bridge, serving until 30 November 1924. He then stood successfully for Pyrmont Ward, 1 December 1924 to 31 December 1927. He was a member of the Finance Committee, 1924-27, the Health and By-Laws Committee, 1925-26, and the Electricity Supply Committee, 1925-26. He sat on the Works Committee in 1924 and was its Vice-Chairman in 1927. He was a member of the Metropolitan Water Sewerage and Drainage Board, 1925-27.